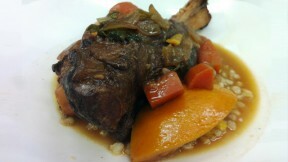 The combination of lamb shanks and a barley "risotto" provide a hearty and comforting dinner. This recipe comes from Simply Ming, hosted by award-winning chef Ming Tsai. In a large pot, cook the barley in an ample quantity of boiling water until tender, about 45 minutes. Using a large strainer, drain the barley, then run cold tap water through it until it’s cold. Drain and set aside at room temperature. Meanwhile, season the lamb with salt and pepper. Heat a stockpot over medium-high heat, add the oil, and when hot, add the lamb. Cook on all sides until brown, 8 to 10 minutes. Transfer to a plate. Add the onions, carrots and celery to the pot, season with salt and pepper, and cook, stirring, until the vegetables have softened, about 3 minutes. Add the wine, deglaze the pot, and simmer until the wine is reduced by a quarter, about 8 minutes. Add the orange quarters, soy sauce, brown sugar, ginger and chiles. Return the lamb shanks to the pot and add enough water to barely cover them. Season with salt and pepper. Bring the liquid to a simmer, cover, and reduce the heat to low. Cook until the meat is falling off the bones, about 3-4 hours. In a medium sauté pan, add the butter, and garlic. Cook until the garlic turns tan. Add barley and toss. Season with salt and pepper. Mound the barley on four individual serving plates or a platter, top with the lamb, spoon the braising liquid over, and serve.